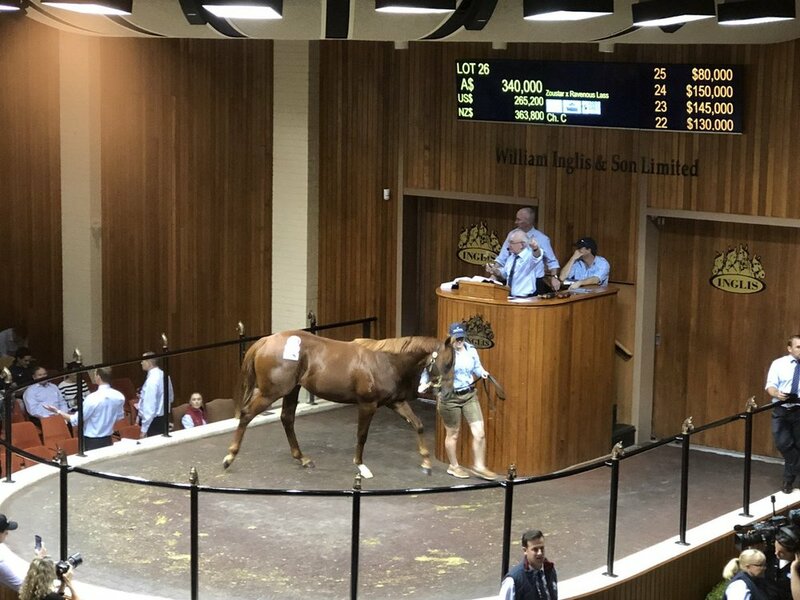 A mare bought in foal to current leading first season sire Zoustar (Northern Meteor) paid an immediate dividend for her owner when the colt sold for $340,000 yesterday to China Horse Club. Consigned by Mill Park Stud as Lot 26, the colt is the first foal out of five-time winner Ravenous Lass (Stratum) who is a half-sister to the juvenille winner and MRC Autumn Stakes (Gr 2, 1400m) winner San Nicasio (Hard Spun). Ravenous Lass was purchased in foal to Zoustar by Hancock Quality Bloodstock for $210,000 at the 2016 Magic Millions Gold Coast National Broodmare Sale from the Laceby Lodge Stud draft. “He was raised on our farm for a client of ours, Brenton Parker, who have been long-time supporters of us,” Mill Park Stud’s Chris Watson told ANZ Bloodstock News. Watson was delighted with the price the colt made yesterday. “It was a fantastic result and being by a lovely up and coming stallion in Zoustar we expected him to sell very well,” Watson said. Ravenous Lass has a weanling filly by Zoustar at Mill Park Stud and is in foal to Darley-based first season sire Astern (Medaglia d’Oro). China Horse Club’s Michael Wallace said the Super Vobis-eligible colt was likely to be trained in Victoria. He was bought wholly by China Horse Club as opposed to by the colts syndicate that includes Newgate Farm and other parties. Only last week, the syndicate retired dual Group One winner Russian Revolution (Snitzel) to Newgate Farm.Wallace said the colt was the only horse on his list at this week’s Melbourne sale. “He is a China Horse Club horse who fits the mould of what we are trying to do, being a shorter coupled two-year-old type,” Wallace said, “We are being pretty selective about what we are trying to buy this year and he is the horse who fitted out mould here. Wallace said the introduction of the $1,000,000 The Showdown (1200m) for two-year-olds by Vobis-nominated Victorian stallions to be run for the first time next year made it an attractive proposition to have the colt trained in Victoria. “We are undecided about a trainer but he is a Melbourne horse and there are some incentives involved around that now,” he said. Zoustar, who stands on rotation at Woodside Park Stud in Victoria and Widden Stud in New South Wales, averaged $223,333 yesterday from three lots sold and ended the day with an aggregate of $670,000. China Horse Club has one Zoustar two-year-old in training with Chris Waller and has also bought a number of yearlings by him so far this year.